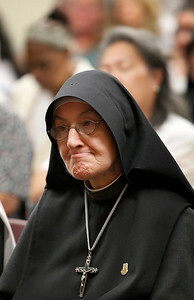 Matthew Apgar - mapgar@shawmedia.com A nun with the Fraternite of Notre Dame uses a video camera to record a McHenry County Board meeting on Tuesday, September 15, 2015 at the McHenry County Administration Building. The congregation was hoping to pass a conditional use only or a variation only zoning petition for the building of a gift shop, a winery, and a nursing home, but was met with 20 votes for no with only three votes in favor. Neither motion passed, which resulted in a large eruption of applause from residents opposed to the petitions. 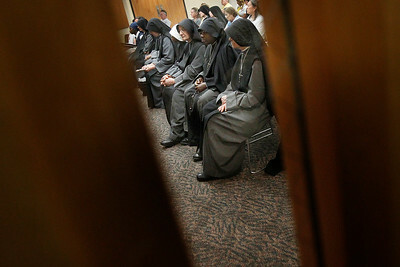 Matthew Apgar - mapgar@shawmedia.com Nuns with the Fraternite of Notre Dame sit silently inside a McHenry County Board meeting on Tuesday, September 15, 2015 at the McHenry County Administration Building. The congregation was hoping to pass a conditional use only or a variation only zoning petition for the building of a gift shop, a winery, and a nursing home, but was met with 20 votes for no with only three votes in favor. Neither motion passed, which resulted in a large eruption of applause from residents opposed to the petitions. 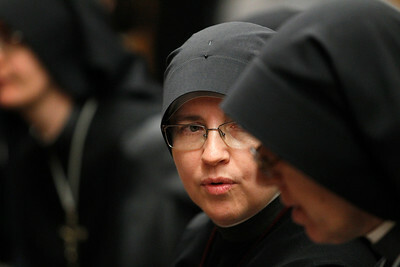 Matthew Apgar - mapgar@shawmedia.com Mother Superior Mary Martha with the Fraternite of Notre Dame, second from right, talks with another nun in the congregation during a McHenry County Board meeting on Tuesday, September 15, 2015 at the McHenry County Administration Building. The congregation was hoping to pass a conditional use only or a variation only zoning petition for the building of a gift shop, a winery, and a nursing home, but was met with 20 votes for no with only three votes in favor. Neither motion passed, which resulted in a large eruption of applause from residents opposed to the petitions. 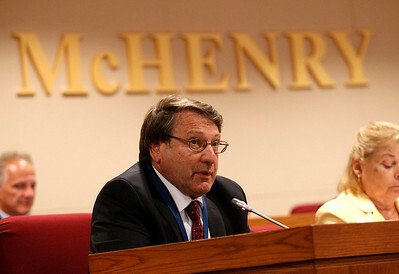 Matthew Apgar - mapgar@shawmedia.com Fathers with the Fraternite of Notre Dame sign in to speak on behalf of their congregation before a McHenry County Board meeting on Tuesday, September 15, 2015 at the McHenry County Administration Building. The congregation was hoping to pass a conditional use only or a variation only zoning petition for the building of a gift shop, a winery, and a nursing home, but was met with 20 votes for no with only three votes in favor. Neither motion passed, which resulted in a large eruption of applause from residents opposed to the petitions. Matthew Apgar - mapgar@shawmedia.com McHenry County Board member Michael Walkup speaks about his objections to a board meeting petition by the Fraternite of Notre Dame on Tuesday, September 15, 2015 at the McHenry County Administration Building. The congregation was hoping to pass a conditional use only or a variation only zoning petition for the building of a gift shop, a winery, and a nursing home, but was met with 20 votes for no with only three votes in favor. Neither motion passed, which resulted in a large eruption of applause from residents opposed to the petitions. 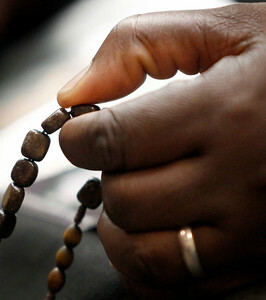 Matthew Apgar - mapgar@shawmedia.com A nun with the Fraternite of Notre Dame prays during a McHenry County Board meeting on Tuesday, September 15, 2015 at the McHenry County Administration Building. The congregation was hoping to pass a conditional use only or a variation only zoning petition for the building of a gift shop, a winery, and a nursing home, but was met with 20 votes for no with only three votes in favor. Neither motion passed, which resulted in a large eruption of applause from residents opposed to the petitions. 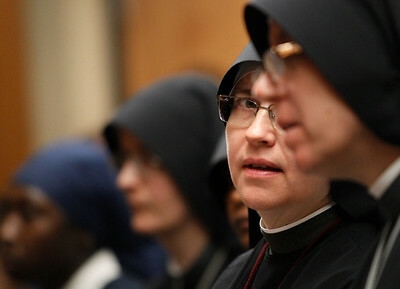 Matthew Apgar - mapgar@shawmedia.com A nun with the Fraternite of Notre Dame reacts as board members voice their objections to the congregation's petitions during a McHenry County Board meeting on Tuesday, September 15, 2015 at the McHenry County Administration Building. The congregation was hoping to pass a conditional use only or a variation only zoning petition for the building of a gift shop, a winery, and a nursing home, but was met with 20 votes for no with only three votes in favor. Neither motion passed, which resulted in a large eruption of applause from residents opposed to the petitions. 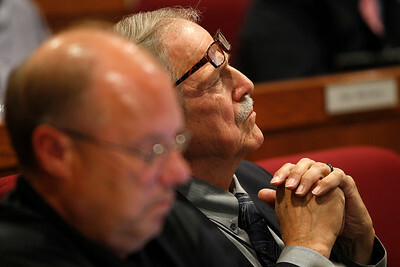 Matthew Apgar - mapgar@shawmedia.com McHenry County Board member James Heisler listens intently during a board meeting petition by the Fraternite of Notre Dame on Tuesday, September 15, 2015 at the McHenry County Administration Building. The congregation was hoping to pass a conditional use only or a variation only zoning petition for the building of a gift shop, a winery, and a nursing home, but was met with 20 votes for no with only three votes in favor. Neither motion passed, which resulted in a large eruption of applause from residents opposed to the petitions. 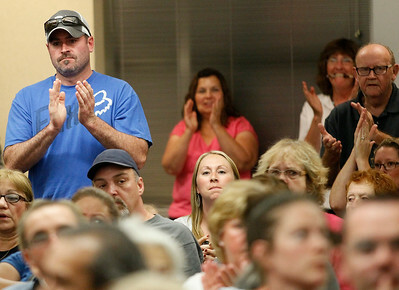 Matthew Apgar - mapgar@shawmedia.com Residents applaud after a McHenry County Board meeting ruled against two petitions by the Fraternite of Notre Dame on Tuesday, September 15, 2015 at the McHenry County Administration Building. The congregation was hoping to pass a conditional use only or a variation only zoning petition for the building of a gift shop, a winery, and a nursing home, but was met with 20 votes for no with only three votes in favor. Neither motion passed, which resulted in a large eruption of applause from residents opposed to the petitions. 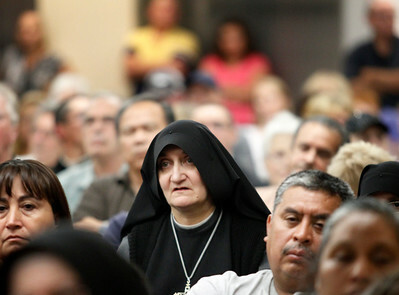 Residents applaud after a McHenry County Board meeting ruled against two petitions by the Fraternite of Notre Dame on Tuesday, September 15, 2015 at the McHenry County Administration Building. The congregation was hoping to pass a conditional use only or a variation only zoning petition for the building of a gift shop, a winery, and a nursing home, but was met with 20 votes for no with only three votes in favor. Neither motion passed, which resulted in a large eruption of applause from residents opposed to the petitions.